Second is a medium-sized church of about 400 members, where we strive for everyone to be known and feel at home. We are a member of the Presbyterian Church USA denomination. September to May Worship: During the school year we hold two worship services on Sunday mornings: our 9 AM service is a compact, more contemporary service in the chapel with music featuring the Second@9 Band; while the 11 AM service is a traditional service in the sanctuary with music featuring our chancel choir and organ. Occasionally, we hold come together as a congregation at a single 10 AM service. Spring 2019 10 AM single services: April 14 (Palm Sunday); May 19 (Confirmation and Banner Sunday). Summer Worship: During the summer months from Memorial Day through Labor Day, there is one service at 10 AM. Dress: You’ll find people from all walks of life here, and that means a variety of styles of dress. Many people “dress up” in their “Sunday best,” but no one has to. Communion: We serve communion on the first Sunday of each month and on Maundy Thursday during the Easter Holy Week. Anyone who accepts Jesus as their Savior can participate in communion. 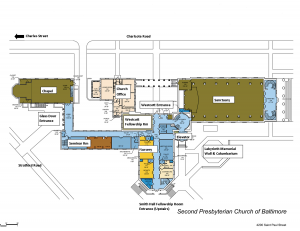 You don’t have to be Presbyterian or a member here. Accessibility: Our sanctuary, chapel, nursery, fellowship rooms and some classrooms are accessible to those with physical limitations. (Only the lower level Sunday School classrooms are not reached by our elevator.) For the sanctuary: use the step-free entrance on the Charlcote Road (Charles Street) side of the church. Look for the one-story white-columned colonnade. A 10-minute designated drop-off area is also available there. For the chapel: use the step-free glass door entrance on Stratford Road. For those with hearing problems, we provide special headsets that amplify sound. Please ask an usher when you arrive. Christian Education Hour for Children and Youth: Our Sunday School for children and youth ages 3 through high school meets from September through May at 10 AM between the two services. The care and education of your children is an important part of the ministry of our church. Learn more. Sunday Morning Adult Seminar: From September through May, we hold a Christian Education program for adults on Sunday mornings at 10 AM in the Westcott Room. Some weeks we explore the week’s Bible text in greater depth, at other times we hold special programs on topics of theological, pastoral and contemporary interest. At all times we engage in lively discussions relating scripture to our own day and life. Childcare: The Second Presbyterian Church childcare staff provide a loving, safe, and clean environment for infants (8 weeks) through age five in the nursery on the main level during both worship services from 8:45 AM – 12:15 PM during the school year, and 9:45 AM – 11:15 AM in the summer. Coffee Hour: We gather for fellowship and refreshments between the services during the school year in the seminar room near the chapel and on the front portico during the summer. Second Presbyterian is located in historic north Baltimore neighborhood of Guilford close to the Johns Hopkins University Homewood campus and Loyola University Maryland. Street parking is available around the church on Saint Paul Street, Charlcote Road and Stratford Road. Visit our location page for a map. 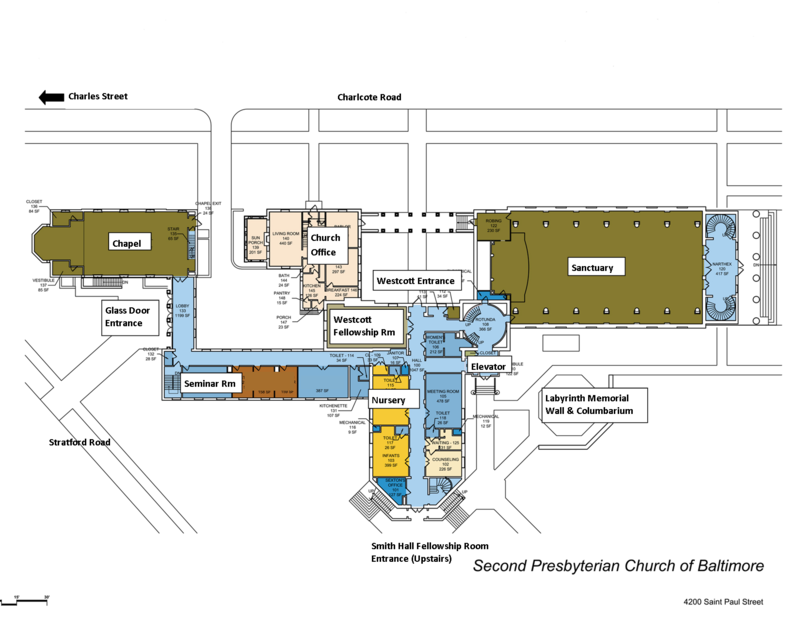 There are many entrances to the church–a source of confusion for first-time visitors. 9 AM service in the chapel: Enter through the glass doors on Stratford Road, or the back door entrance to the chapel on Charlcote Road. 11 AM service in the sanctuary: Enter through the main entrance at the front of the church, or from the sides on Charlcote Road, or Saint Paul Street. The side entrance on Charlcote through the white-columned colonnade is wheelchair accessible. Whichever you choose, someone will greet you and happily tell you where to go and answer any questions you may have. We want to help you find ways that are right for you to worship, care, grow and serve. Explore our website to learn more about opportunities to connect with God and each other through for worship, fellowship, mission, small groups, and Christian education. Look in the weekly Sunday bulletin for activities that may interest you. Fill out a pew visitor card and drop it in the offering plate. Introduce yourself to one of our Deacon greeters or our Pastors before or after the service. Sign up here to receive our weekly “Friday Flyer” e-mail updates. Call the church office at 410-467-4210.